Augusta Health and Rehabilitation and SilverLeaf of Augusta Assisted Living recently earned a perfect survey score from the State of Wisconsin. “This is a tremendous accomplishment for our staff and facility. I am so proud of everyone and the work they put in day in and day out to provide quality care. We are a 5-star facility because of the staff and the care they provide,” Administrator Jahn Bradley said. Augusta Health and Rehabilitation is a five-star rated facility with a proud history dating back over five decades and generations of families. The new, state-of-the-art facility opened in 2016 and serves residents with skilled nursing, assisted living and provides rehabilitation for residents as well as outpatients. Bradley said the nursing home survey is done every year and takes state inspectors between three and five days to examine the facility. “The state average is seven citations per survey. We had zero. We are so excited for our employees and the people who call Augusta home,” Bradley added. 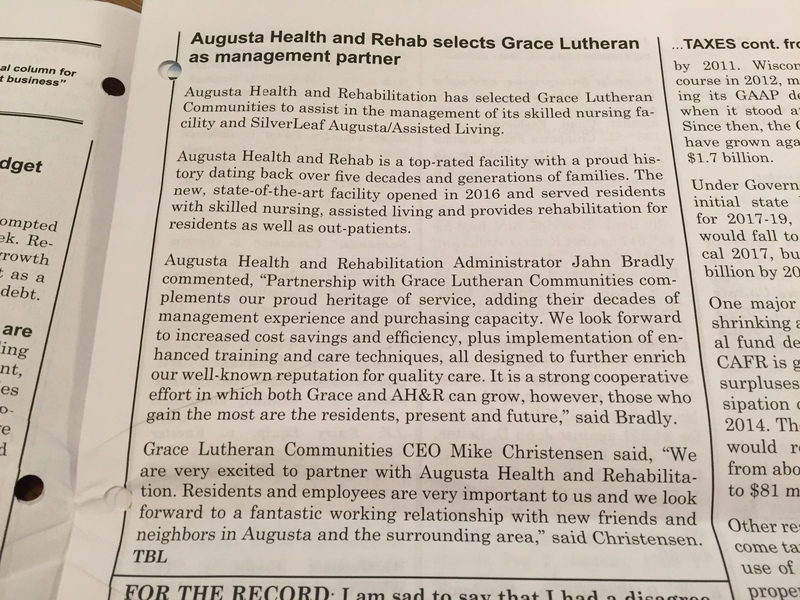 Augusta Health and Rehab selects Grace Lutheran as Management Partner as seen in The Bottom Line.